There are 4 shops proposing this game for download at an average price of $ 11.60. Based on the classic story by Alexandre Dumas and playing out like a modern version of classic platformers like the original Duke Nukem and Commander Keen, this a joy-filled romp of a game which is well worth closer inspection. It's not exactly overly complex but if you're a fan of faster-paced platformers like Sonic, then there is much to enjoy here. You take control of Porthos, who takes this opportunity to shine when, while enjoying the local tavern, his fellow Musketeers are kidnapped by the evil Count Xavier who has some dastardly plans in mind for the heroic band. 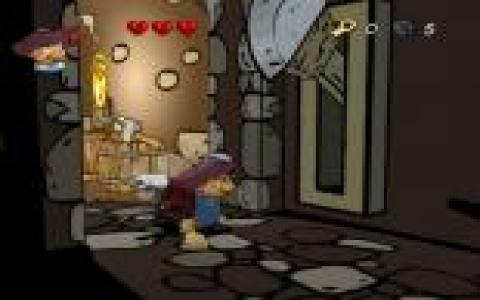 What follows is a fairly traditional platform adventure where you must make your way through a series of side-scrolling levels while avoiding obstacles such as wine barrels and taking out the bad guys. Human enemies are usually sword wielders who must be taken out close combat but you'll also find archers shooting at you from afar. You main weapon is your own trusty blade but you'll also need quick reflexes to find your chums and save the day. This is a long way from being complicated or difficult to pick up and as long as you're in the mood for some simple, fast-paced fun, this makes for a near perfect choice. It's got some splendid comic book-style visuals which do a great job of bringing this world to life and with sound to match. The whole thing is super easy to pick up, with very straightforward controls that are nicely responsive. It is a quick game which might put off some players but if you're up to the challenge, this is a fine romp.